Wash and pat dry flounder fillets. In a bowl, add 1 cup of cracker crumbs, ½ cup ground almonds, 1 teaspoon of parsley flakes, 1 teaspoon of dry mustard, ½ teaspoon of old bay seasoning, 1 large egg, 1 tablespoon of olive oil and 3-4 tablespoons of low fat mayonnaise. Mix all until blended. Spray the bottom of a baking dish with cooking spray. Place the flounder fillets in the baking dish. 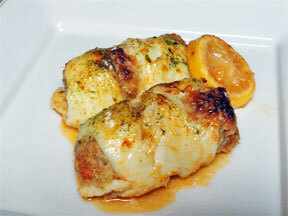 Top each fillet with a mound of crabmeat filling, dividing evenly among the 4 fillets. Roll the fillets with the seam at the bottom. Squeeze fresh lemon over each fillet and sprinkle salt, pepper and paprika. Bake at 350 degrees F for 25 minutes and broil for another 5 minutes.